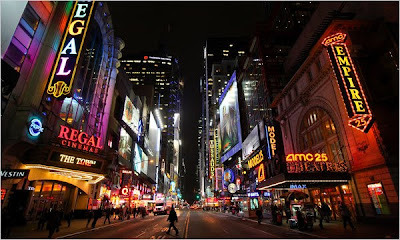 Maximizing Progress: Square Times ~ From Dirty Deuce To Disney NYC! Square Times ~ From Dirty Deuce To Disney NYC! "Next month, 11 Times Square, a new, glassy 40-story office tower at 42nd Street and Eighth Avenue, will formally open with its first tenant. Compared with the metamorphosis that has occurred around it, there is nothing extraordinary about the building except for this: Its completion officially marks the end of the long and tortuous redevelopment of Times Square, an effort that began 30 years ago [...] It embodied both the hubris of urban master planning and its possibilities, and showed the value of ripping up blueprints and starting over in midstream. And it has been a touchstone experience for a city that is now building, or trying to build, several multibillion-dollar projects [...] The oft-heard complaint about the Disneyfication of Times Square sometimes loses sight of the fact that it was the Walt Disney Company, perhaps more than any other, that helped start the turnaround."